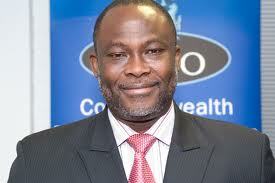 Dr. Ekwow Spio-Garbrah is a leading member of the ruling NDC in Ghana. A comment by Ekwow Spio-Garbrah, a first Vice Chairman of the National Democratic Congress (NDC) that President John Evans Atta Mills is a wicked and callous person has sparked new war of words in the ruling party, causing fear and panic among the rank. Spio who has penchant of dropping bombs in the Mills administration told a gathering of NDC student wing in Accra that he doesn’t understand while the government was giving former President Jerry Rawlings a raw deal inspite of his role as the founder of the party. Addressing a controversial Tertiary Education Institution Network (TEIN) workshop in Accra yesterday, Dr. Spio-Garbrah who is currently the Chief Executive of Commonwealth Telecommunication Organization (CTO) in London said President Mills is wicked and callous because he had rendered Ex-President Rawlings a destitute, in the midst of thousands of state houses in Accra. He had said among other things that even though there were over 1000s state bungalows in Accra alone the President Mills has not made any effort to resettle the founder of the party whose house was gutted by fire on Valentine’s Day this year. Spio said that the government’s inability to resettle Rawlings had given the opposition New Patriotic Party (NPP) the chance to ridicule the government. “I understand that President Rawlings cannot award contracts today and that because he doesn’t make appointments anymore he is not relevant and of no value to the party. Otherwise it is not possible that even when disaster victims faraway in Haiti can receive a donation of $3million but when a disaster befalls the founder of the party and former President of the Republic of Ghana who by the Constitution is required to be given official accommodation, till today he does not have official accommodation. And yet there are over one thousand Government bungalows in Accra and I personally have identified some of them and have recommended it to the people concerned. “NPP don’t take us serious because they see that we are unable to house our own father and are aware that the party is not strong enough to face them in the 2012 election,” he said. Spio took on members of the party who claim the term ‘foot soldier’ was a creation of the NPP and alien to the NDC. According to him, the NDC has been hijacked by certain individuals - mainly CPP and NPP elements - to the detriment of loyal party members. He expressed regret that National Executives of the party, who were begging foot soldiers for votes some few months ago, are now distancing themselves from them, claiming the concept is alien to them. “Foot soldiers were not something created by the NPP as some people are trying to suggest. So we cannot alienate the foundation of our party being the foot soldiers and the Leader and Founder of our party being President Rawlings, and then be hanging in the middle and call ourselves a party that is going for an election,” he said. He also re-emphasized that some of the appointees in the Mills government are incompetent and mourned over the fact that many others like him (Spio) had been sidelined and loaded the government with under age people which popularly refers to as ‘Team B’. But the Dr. Spio-Garbrah met his match in Samuel Okudzeto-Ablakwa, a Deputy Minister of Information who lambasted the NDC vice chairman, accusing him of inciting NDC youth against President Mills. He said Spio wants to say that he is the most experienced politician who was not serving in the Atta Mills-government but the Deputy Minister said there were many ways that one can contribute to the party. He reminded Spio that not everybody could be appointed by the President to serve in the government and compared governance to the game of football where there are substitutions. “Alban Bagbin, Minister of Water Resources Works and Housing and Nii Afotey Agbo a Minister of State were all critics of the government yet President Mills appointed them as Ministers later on,” he told Joy FM last night in reaction to Spio’s bomb. Okudzeto Ablakwa said what Spio-Garbrah was doing that to incite the youth against President Mills and his appointees and asked rhetorically that chasing officials with clubs and sticks, is that what Dr. Spio-Garbrah wants? “He said President Mills is callous and wicked and when he was caught on tape he says he did not know the media were there,” the Deputy Minister queried. It is now clear that misunderstandings and confusion that has rocked top echelons of the ruling NDChas trickled down to the youth wing of the party as the yesterday’s event was sponsored by the Rawlings faction of the party with NDC matriarch, Nana Konadu Agyeman Rawlings in attendance. The open defiance and disrespect displayed by some TEIN members despite a directive from Ludwig Hlodze, the National Youth Organizer calling on the TEIN executives not to hold the workshop shows how the party was struggling to deal with indiscipline. A text message from Dr. David Sunu, the organizer of the workshop had asked the TEIN executives to report at the Teachers’ Hall aka GNAT Hall near the Ministry of Information in Accra between 8 am and 6 pm yesterday for a youth empowerment workshop which was believed to have been sponsored by the Rawlings camp. Themed “Resources untapped: Harnessing the full potential of TEIN”, the workshop was to encourage the youth of the party to work hard for the NDC to achieve its goals but Mr. Hlodze released a statement on Sunday asking TEIN executives who received the message to disregard the content because it was a hoax. However the TEIN members defied the directive and attended en masse. But yesterday at the Teachers’ Hall where Dr. Spio-Garbrah dropped the bombshell in the presence of Nana Konadu Agyemang Rawlings, the workshop was held with about 50 of TEIN members in attendance. At the main entrance of the Teachers’ Hall, a large NDC banner with the inscription: “Our Road to Freedom” while the workshop was held on 4th floor of the GNAT complex. The workshop details were that Dr. Benjamin Kumbuor, Health Minister who was at that moment taking his turn at the meet-the-press series was to speak on the topic: The historical antecedents, core principles and values of the NDC, while Kofi Kukubor, a patron of TEIN in the Greater Accra Region was to speak on the topic: Identifying, harnessing and improving the potential of TEIN. Furthermore, Enoch Teye Mensah, Minister of Employment and Social Welfare was billed to speak on the relevance and place of TEIN in the NDC while one Mr. Shaw was to speak on the topic: Empowering the youth to take their destiny into their own hands/job creation. Dr. Gameli Norgbe was to address them on: The succession plan – Preparing the youth for leadership while former first lady, Nana Konadu Agyemang Rawlings was billed to tackle the topic: NDC youth participation in governance. As at about 11:45 am, only Mr. Kukubor was present to address the participants and the youth took turns to bemoan persistent neglect of the party’s youth by the NDC leadership. Spio later joined the workshop where he dropped the bombs saying that he did not know that journalist were in the hall. When reached for his comments on the defiance by the TEIN, Mr. Hlodze said “I still insist it was an illegal workshop. It does not have the blessing of the party or the youth wing of which I am the head. They did not have my consent to hold the workshop. “People who claim to be members of the NDC must respect the rules and regulations of the party. We should not do things to undermine the very structures that we have all helped to put together,” he said. He said Dr. Sunu cannot be a member of TEIN because he is a practicing medical practitioner and not a student and wondered how they came by the funds to organize the workshop and even camping some of the delegates, when the same people had been coming to him for chop money and rent allowances. But Dr. Sunu said it was Mr. Kukubor, some TEIN members as well as some officials in the government who sponsored the workshop.